A journey from Brittany to Bagdhad!!!! Moskitto Bar is a fresh and unique sound created in the multi-cultural hub of Toronto, Canada. 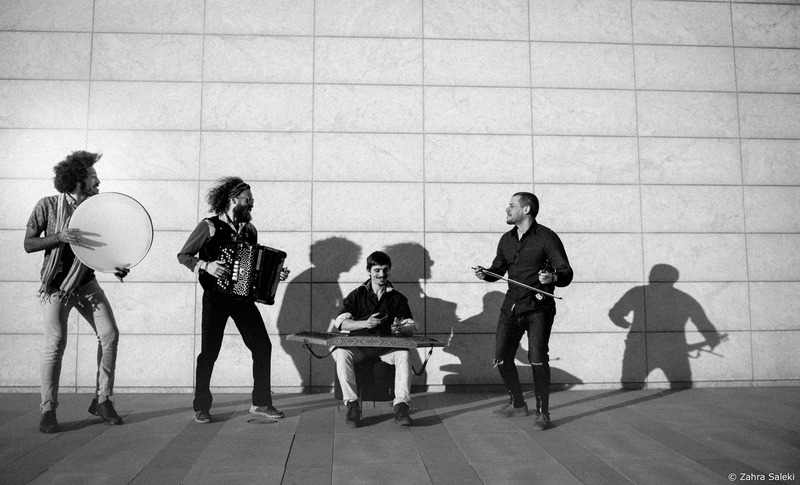 Their sound combines a beautiful and original mix of Ukrainian, Balkan, Iraqi Middle-Eastern and French Celtic music. The project was initiated by Tangi Ropars when he met newcomers Yura, from Ukraine, and Ahmed, from Iraq. In June 2016, during a gathering in Northern Ontario, they met every day in the woods to share and teach each other their respective melodies and rhythms. As they were playing, the rural Ontario mosquitos, were joyfully feasting on the multicultural group inspiring their eponymous name. 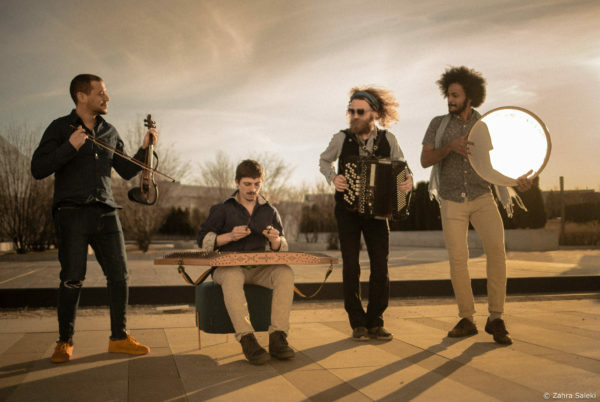 Almost two years later, the trio connected with the notable violin player, Fethi Nadjem freshly landed for Algeria, adding his oriental flavour to the sound mix. 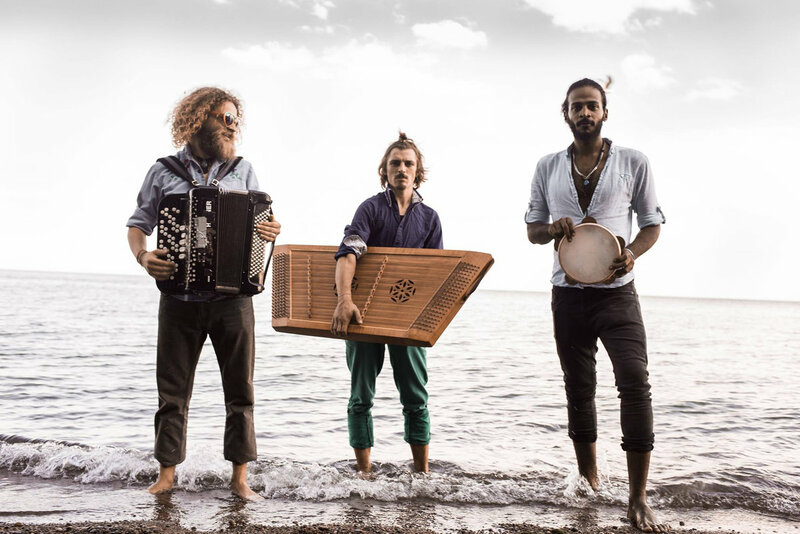 Toronto saw the band playing in the streets, community events and bars and more recently in public libraries, Aga Khan museum, Opera House, Ashkenazi festival and Korner Hall. Moskitto Bar shared the stage with international musicians such as famous Russian band Dobranotch, the Bosnian icon Bozo Vreco, and Burdon Fold Band from Ukraine. Collaborations with other artists is embedded in the band’s culture. The Moskittos and their community of musicians can often be found jamming at Drom Taberna the new iconic live music venue in Toronto. Tangi Ropars was born in Toronto, grew up in France, sings and plays the button accordion. Yura Rafaluik is from Ukraine, plays the cimbalom (hammer dulcimer) and sings. Ahmed Moneka grew up in Baghdad, Iraq, sings Maqam (Arabic skills) and plays percussions. Fethi Nadjem was born in Algeria, plays the violin and sings.